Have you had a chance to set up your Pinterest account yet? If not, you're missing out on some great ways to view real estate and other great ideas that will help you improve the real estate you already own. It's very simple to start using the site. They've removed their "Invitation Only" login and now you can get started with your Twitter or Facebook account. If you do not have accounts with either of those social networks, you are able to go about it the old-fashioned way... with your email address. Visit www.pinterest.com and sign up. When you've created your account, it's very easy to get carried away and start pinning everything at random. Try to keep your account organized. Pinterest already provides you with a bunch of default boards. These boards were created to take away the confusion. When you pin something, place it under one of these categories or "boards." 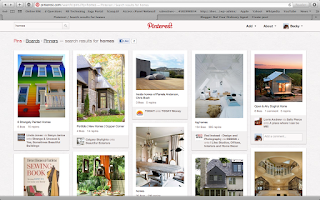 If you are currently trying to decide what style of home you like, visit Pinterest and search for "homes" in the box on the top left of your screen. Pages of images of different homes will appear on your screen. Create a board for the homes you like and homes you don't like. This is a helpful way to narrow down what it is you are looking for. This is also great practice for determining home improvement projects. You can discover what works and what won't work in your home.